Delaware Metals machines exotic plastics and metals to our customer’s specifications. We can handle a variety of materials that other machine shops do not work with due to their properties, machinability and/or cost. One such exotic plastic we frequently machine is Rulon J. Rulon plastics are known for their low coefficient of friction, excellent abrasion resistance, wide range of operating temperatures, and chemical inertness. Common applications for Rulon include seals, piston rings, bearings, and electrical insulation. 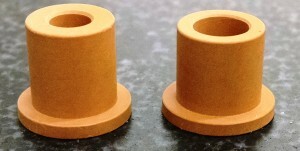 We machine a lot of bushings out of Rulon J due to its properties, these being for a high-speed gearbox application. If you are having troubles finding the best materials for your project, give us a call. We have the knowledge to help you pick the right material, and the technology/skill to machine it. Delaware Metals, in Newport, DE, has added several new machine tools to keep up with additional demand in it’s services, including CNC Machining, Metal Fabrication, Prototype Development and Assemblies. 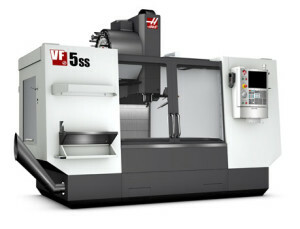 Recently we added a Haas VF-5SS Super-Speed Vertical Machining Center ; 50″ x 26″ x 25″ (1270 x 660 x 635 mm), 40 taper, 30-hp (22.4 kW) vector drive, 12,000 rpm, inline direct-drive and high-speed 40+1 side-mount tool changer. This machine is equipped with a 12,000-rpm, 40-taper spindle that features a unique inline, direct-drive system that couples the drive directly to the spindle rather than using belts. This results in smoother transmission of power, less heat and less noise than other drive systems, providing better surface finishes, extreme thermal stability and very quiet operation. We are continuing to update our shop to better service our customers in the Aerospace, Automotive, Medical Device, Pharmaceutical and other Industries. We are continuing to partner with new customers with this added capacity in our shop. Delaware Metals is proud to announce it has completed its Triennial ISO 9001-2008 certification. We are committed to quality manufacturing in prototyping, precision machining, fabrication and assembly of metal and composite materials. We have been ISO certified since 1999, updating our certification to keep up with the most recent revisions. We are continually monitoring our processes to insure the highest quality to our customers. Industries served include aerospace, automotive, medical device, pharmaceutical and other applications. Our new Okuma 4-axis CNC Lathe allows us to perform multiple direction machining without changing tooling. 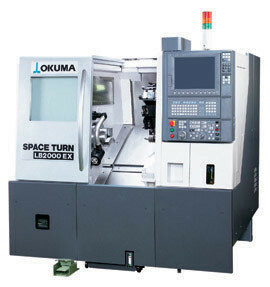 The Okuma SpaceTurn LB3000EX Twin Spindle Lathe was ordered to include the additional Y-Axis, Live Tooling, and an LNS Bar Feeder. With complete machining on a single tool utilizing left and right spindles as well as upper and lower turrets, we can achieve the ideal cycle balance of primary and secondary operations to assure maximum productivity. Our new Okuma GENOS L300-M and GENOS L300E-M Turning Centers, both with live tooling, give us even more turn/mill capacity. Built on a one-piece, cast iron base with a horizontal way system and hand-scraped headstock and tailstock mounting surfaces, this machine provides stability, rigidity and accuracy for a variety of applications. With 10″ chucks, live tooling, and additional Y-axis, these machines are powerful additions to our shop offering increased capacities and quicker delivery to our customers. Delaware Metals in Newport, DE is proud to announce their updated website www.delawaremetals.com. Specializing in Precision Machining and Fabricating Services we have been servicing DE, PA and NJ since 1953. Our services include precision CNC machining as well as the prototyping, fabrication and assembly of metal and composite materials for aerospace, automotive, medical device, metrology, nuclear, and pharmaceutical applications. Our commitment to quality is the result of having qualified personnel dedicated to meeting our goal of serving the customer. We have the knowledge, experience, and skills to make your toughest designs a reality. We are always willing to expand our services to meet the needs of our customers, and we are not afraid to add equipment to increase our capacities when customer requirements dictate doing so. Our quality standards include ISO 9001:2008 and UL registration. We are proud to announce the installation of our new Zeiss Contura G2 Coordinate Measuring Machine. The Contura provides for flexible, reliable and uncompromising quality assurance. 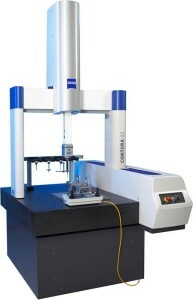 This new CMM offers a large measuring range while allowing us finer accuracy on more complex measurements. This results in a greater capacity to be able to serve our customers. With outstanding scanning technology, the Zeiss Calypso software almost limitless in its measurement capabilities, and incorporates into our quality assurance program effortlessly. © 2019 Delaware Metals. All Rights Reserved.